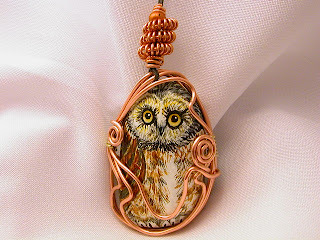 This is a little hand painted pebble Owl. Sitting in a copper wire harness, as of now it is temporarily strung on a black linen cord with a hand coiled copper wire bead... I have been looking at this little guy for several months trying to envision the necklace that he will be connected to... stay tuned I will get it done eventually!